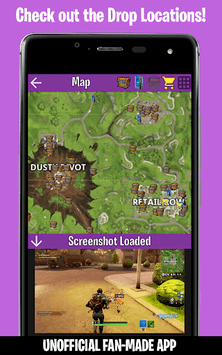 This Unofficial App is full of useful tools for Fortnite Battle Royale and Save the World players! 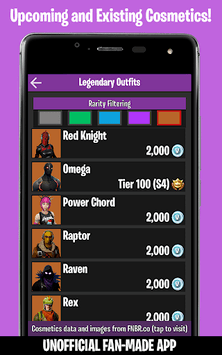 The highest ranked Companion / Assistant / Guide / Tracker App for Fortnite. Having this Companion App for Fortnite on your phone will improve your experience with the real game! 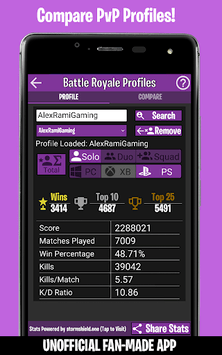 ★Stats Tracker : View Battle Royale Player Stats grouped by squad type and platform. Favorite Players for even quicker lookups. You can also compare that stats of any two Battle Royale players, perfect for tracking how you are doing compared to your friends. ★Store: Shows all the items currently for sale in the BR Store, with images and vbucks prices. ★Leaderboards: Supports all squad types, platforms and several metrics. ★Battle Royale Map: It includes an overlay of possible chest, ammo, shopping carts and vending machine spawns. View in game screenshots of locations. ★Battle Pass Challenges Tracker and Guides: Tracker feature that lets you track your progress with all the weekly challenges, also has a visual guides with maps. ★Items: Descriptions of all Battle Royale items. ★News: From several sources, including the Fortnite Site, Forums and Youtube, as well as Battle Royal specific news from Fortnite Insider. ★Daily Llama and Mission Alerts: Get up to date information about current Mission Alerts and Daily Llamas on your device. You may also subscribe to receive Push Notifications for important Llamas and Rewards. The mission tracker shows Alert, Storm and Group missions, including type and rewards. ★Research Reminder: Schedule a notification when it's time to collect your Research Points! ★Player Profile and Cooldowns: Get up to date information and stats for any Fortnite Save the World Player Profile including Mission Alert and Storm cooldowns. ★Collection Book: Keep track of the Heroes, Traps, People and Weapons that you own or have booked making it easier for you to choose Rewards. Includes a supporter features that can summarize your Book state and show only the missing items. ★Weapons Database: View info and compare stats between all Fortnite weapons. ★A Monster information bank of all the monsters in the Fortnite World. Many thanks to the community, the Fortnite Wiki and Stormshield.one (SS1) for everything! This App aims to be fully compliant with the Epic policies, if there is any concern regarding the compliance, please contact us with the details.